When people in the St. Louis area think of diet and oral health, they ordinarily think about the damage sweet drinks can cause to teeth. While it’s true that these detrimental sugars cause increased acidity in the mouth and lead to tooth decay, soda and sugary-fruit drinks are only part of the issue. The typical American diet tends to be high in calories and low in nutrition, even here in Florissant and Maryland Heights. If your body is lacking in vital nutrients, the tissues in the mouth may have trouble resisting infection. These detrimental infections can lead to gum disease. 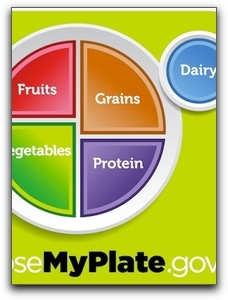 A few years ago, the U.S. Department of Agriculture unveiled the MyPlate graphic to illustrate a healthy diet. Half of our meals should be composed of fruits and vegetables and the rest should be equally divided between lean protein, whole grains, and low-fat dairy. While this is an excellent resource, vital dietary needs change throughout life, so it’s a good idea to call us at 314-837-7744 and schedule a check-up with us to see if your diet is affecting your teeth. When you eat a balanced diet and feel your best, you’ll want to look your best, so be sure to ask our friendly staff about unprecedented cosmetic dentistry procedures such as smile makeovers and same day restorations. At Koch Park Dental – Martin L. Buchheit, DDS, our menu of services includes crowns, veneers, inlays, onlays, dental implants, tooth colored fillings, sealants, teeth whitening, and clear braces.